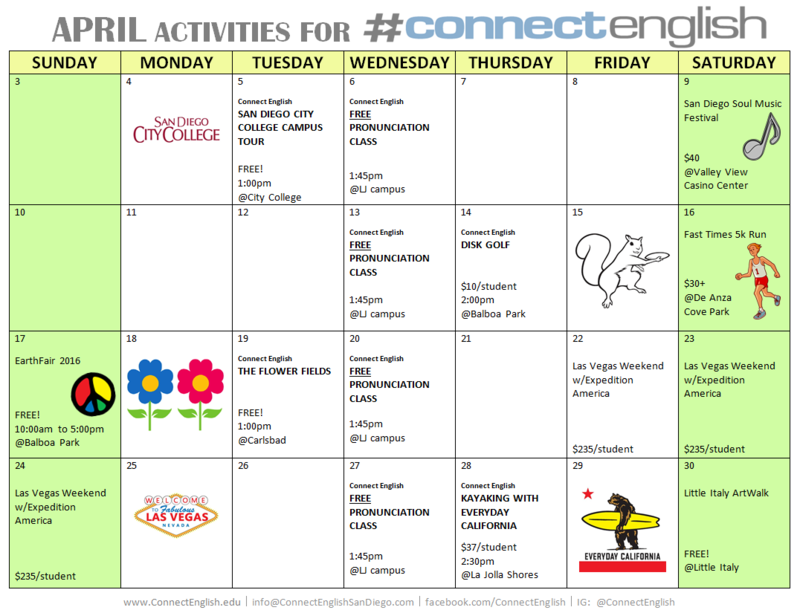 April is coming and we have great activities on this month! The community college system in California is an excellent way for international students to finish the first two years of a quality bachelor’s degree without paying the higher costs of the good universities. Connect English wants the students to know and understand this option well, then pass the TOEFL and get started toward their academic goals. Come with us on a tour if this great college in San Diego! Golf is a lot of fun, but difficult. Disk golf is easier and a lot more fun! We’re taking our students to try out this new sport at the most popular course in San Diego: Morley Field at Balboa Park. Enjoy the sun, your friends, and plenty of sunshine! This amazing sight is only blooming and beautiful for a few months in the spring, so this is your opportunity to see this giant flower farm with its brightest colors. Students always say it’s amazing! La Jolla shores is one of the most famously beautiful aquatic fun areas of San Diego. The beautiful beach, the amazing cliffs, the luxurious homes, and now the excellent fun with Everyday California. They’ll take a group of 20 Connect English students to paddle to and maybe through some of the fascinating sea caves that have brought thousands of tourists to this attraction.